Prominent researchers and clinicians describe in detail all the latest laboratory techniques currently used to define the molecular genetic basis for congenital malformations of the heart, cardiomyopathies, cardiac tumors, and arrythmias in human patients. In particular, the methods can be used to identify in clinical samples those genetic mutations responsible for such congenital abnormalities as Marfan syndrome, Williams-Beuren Syndrome, Alagille syndrome, Noonan syndrome, and Friedreich ataxia. 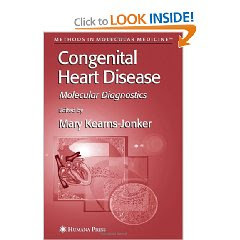 The authors also discuss the limitations of identifying patients with congenital heart disease using these techniques during both pre- and postnatal periods. to mе. It’s quitе informative and you're simply obviously extremely well-informed in this field. You have popped my own face to different views on this particular subject matter along with intriguing and reliable articles.